Do we think he can better Coulthards 13 wins in his career? Personally I say yes as he's been good so far. Despite what he saysd to the media I could see Paul eyeing up up a Ferrari seat for next year, and was that Anthony Hamilton seen leaving a meeting with SD this weekend? Anyway, yes he does deserve his own thread, really like Paul, his driving, and his attitude. He's one confident charming bloke! He was once asked about Lewis and Vettel being World Champions, and he said "I don't want to sound big-headed, but I wasn't racing them when they won their championships". Paul of the Gentlemen's Business? Sign me up. He surely deserves an official thread because for sure, he is a Star of the future! His drive at Bahrain, surely proved his merit & his talent! Force India are expecting a good rise in performance from their Muggelo upgrades & so shall Paul! He really is one for the future. Hope he gets a podium sooner rather than later! We'll see what Force India can come up with in Europe, as they said they was saving the big upgrades for then. All this is even more justified as motorsports runs in the viens of the British people! I even love Brands hatch! What a classic track & so much fun to drive on! There are still some more great tracks in Great Britian & having so many racing tracks around, gives budding drivers a chance to shine in their motorsport career! 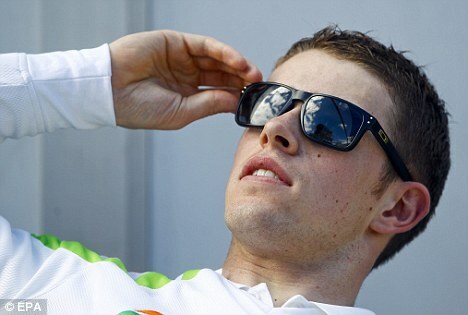 Hence, Lewis Hamilton, Jenson Button & now Paul Di Resta is rising to the occassion! Bordering on arroganice IMO, but then I suppose that is true of all of the drivers. Just heard on the radio, Jackke Stewart saying Ferrari should consier Di Resta. Get it in early in the season. He thinks Alonso would be the perfect teammate to teach him, & there we all were saying Perez to Ferrari. I would love him to go but this is just Stewart's opinion not Ferrari inquiring in him. So far he is doing better against Hulkenberg than i thought, but the Hulk will strike back sooner or later, it took him a while to gain the upper hand over Barichello as well. The multi million dollar question for PDR will be, who out of the top teams is willing to take him and build a team around him, if any. MercedesGP seems to have plans for Rosberg long term and then there are the ongoing Hamilton to replace Schumi rumours. I think that DiResta is a backup should Schumi retire and Merc cant secure Hamiltons services. Can´t see him in another competitive team where he could challenge for race wins and the WDC. At Ferrari as Alonso´s #2 (after Button, Rosberg, Perez and Webber said thanks, but no thanks) he would have to support Alonso and thats it. Anyone else excited at the idea of Nico Vs Di Resta? Anyone heard how Ross Brawn is now? Will he be at Moncao? Not me. I hope this doesn't happen. A sixth place finish in 2012 is hardly an outstanding performance when you look at what equally competitive teams have achieved. I'm looking at Sauber and Williams. Besides, Adrian Sutil destroyed Paul Di Resta. Umm, I don't remember Hulkenberg outperforming Barrichello. Pretty sure Barrichello annihilated him from start to finish in 2010. Oh, except a fluke qualifying achievement in Brazil that Patrick Head and Frank Williams both seemed equally unimpressed by. Yes 6th place is crap when Williams are winning & Sauber come close etc etc etc. The FI is not as good as many of the cars. Maybe equal to the Toro Rossos? He has extracted what he could & has been out qualified once & out raced once by his teammate which happens to every driver except Alonso with Massa. Last year was his first season & in a car that could finsh 9th at very best (with no big team retirements) he did well & would expect Sutil to beat him but he wasn't destroyed & in fact qualified much better than Sutil. for the first half of the year. He made rookie errors but hey who doesn't? That is side-stepping the question though, isnt it? I wasn't asking whether Paul is entitled to this opportunity. I wasn't asking whether Sutil should be in a Ferrari or a Mercedes or any car beyond the one he needs to drive to make the appointment with his parole officer each week. I think it would be interesting to see how Nico and Paul match up. Also, Paul has history with Mercedes, so you would hope he would hit the ground running. He be one talented driver but he be walking my plank for bouncing up and down everytime he be doing yon interviews. Yarr!!! Row, row, row your boat, gently down the stream. Merrily, merrily, merrily, yaarrrr. Drink Up Me Hearties Yo Ho! I thought I answered the question quite directly. I started by stating I don't share your excitement at the prospect of Di Resta joining Rosberg at Mercedes. I read the article, (prior to your link) and justified my position by referencing his "continuous improvement, highlighted by his sixth-place finish at the Bahrain GP" isn't very meaningful when compared to results other drivers have achieved this season in similarly competitive cars. ie. the Williams and Sauber drivers. True, you didn't ask about Adrian Sutil. However, he's relevant because he outperformed Paul Di Resta in 2011 and is currently seeking a drive for 2012(3). I'd much rather see him, among other drivers, in either a Ferrari or Mercedes F1 seat before Paul Di Resta. Once again to be ensure I'm not side-stepping your question. No. I'm not excited about 'Nico Vs Di Resta'. I'd much rather see 'Rosberg vs Schumacher', or 'Rosberg vs Sutil', or 'Rosberg vs Kobayashi', or 'Rosberg vs Glock'. PDR destroy Rosberg? I'd love some of those drugs. Hasn't done anything to impress me so far in his F1 career. If he's as good as the British media claim he is he should have thrashed Sutil, rookie or not. He didn't and I personally didn't expect him to do so. I'm not keen on some of the rather arrogant comments and claims he's made since joining the F1 pack. As for this year, we'll one 6th place in such an unpredictable season isn't much frankly. Hulkenburg has grossly underperformed and if he gets his act together then Paul may have to raise his game to new levels. He'll probably end up at Merc as Schumacher's replacement simply by default that Merc have no one else really left to look at. Hamilton will probably stay at McLaren, Webber at Red Bull, Perez to Ferrari and no one will look at Massa. The only threat to Di Resta and that Merc ride is Hulkenburg if he ups his game and beats Paul by the end of 2012. IMO I don't see Di Resta and Rosberg being a productive matching. They both seem quite conservative drivers and that can be unproductive when it comes to driving a team forward. We shall see though. He'll have to beat his team mate this year first. Am I the only one who thinks this guy has a complete personality bypass? He has absolutely nothing interesting to say in interviews, I suspect he has been coached in the art of talking but saying nothing. As far as the races are concerend he is completely anonymous too, I wouldn't even notice if he wasn't there! Is there a spark of brilliance that marks him out to be a future great? I don't see it. I see a very safe average journeyman driver, someone similar to Heidlfeld, he will bring the car home in one piece and put a few points on the board, nothing more. As they say stick him in a good car & lets see. I think he has the potential to be around Button's level. Win a few races, keep it clean & if he gets the right car a world championship. Lol, thanks for the explanation. I thought it was all pneumatic. Three cheers for potential mediocrity? Yes winning the WDC is mediocre. The way you worded your post definately implied mediocrity. "As they say stick him in a good car & lets see." Without being pedantic - where's the justification? How does that differentiate Di Resta from sticking any other driver in a good car and as you put it "let's see"? "Win a few races, keep it clean"
So Di Resta can win a few races and keep it clean? Because he's one of the few Formula 1 drivers capable of doing that in a good car? Finally "& if he gets the right car a world championship." The right car can win the World Championship with Di Resta inside it? Who else can do the same thing in the 'right car'? Yeah, I'm being pedantic but that post had mediocrity written all over it. Di Resta is built up so much by the British media (I've noticed it a lot with Brundle), it's only natural of course as they want to be patriotic but it's funny when you see broadcasts from other nations that the attitude they take towards Di Resta is that he is ok, not bad or special just ok. As for me, well he tends to disappear from the broadcast during races which is both a good and bad thing. Good in the way that he isn't making mistakes or crashing, but bad as he isn't doing anything noteworthy. If he wants a top drive he will need to step it up a notch on the track and draw some attention instead of speaking confidently in interviews. Danger is real, fear is choice. Is there another driver on the grid who is as anonymous on race day as Di Resta? It doesn't matter where he qualifies he always seem to go backwards and just be a complete irrelevance in the race. At the start of the season all the talk was of him replacing Schumacher at Mercades next season but why? Now there is talk of him going to Mclaren if Lewis leaves. Again, why? Hulkenberg, Kobayashi, Perez, Kovalainen and especially Maldonado have impressed me a lot more this season from the mid field teams. To be honest I haven't seen Di Resta do anything notable, except when he has done one stops that ended up working. The British media are backing him which is to be expected of them, like when the BBC listed him as the best rookie in 2011 because he had the most points, when Perez was doing a much better job. We'll have to see if he does anything spectacular this season, but I think he's just another play it safe midfield driver. Exactly what the doctor ordered today, excellent drive from PDR. His best drive no doubt. Always does well in Singapore. Only wished had he got a podium. So close. So close. Great drive from a very underrated driver on here, he get's the most slating and look at the poll of people preferring the Hulk over him despite Di Resta overall having the edge. Both fine drivers and very close but I still feel over the whole season Di Resta will always edge, still some races to go though and anything can happen but for Di Resta he just has to keep doing his thing. Last edited by Jomox on Sun Sep 23, 2012 2:12 pm, edited 1 time in total. Great drive, happy for him! Best result so far! Now only if there would be an opening in Mercedes at the end of the season, he would get promoted. Force India now only need a podium as Williams & Sauber have achieved it. How did Perez having a pathetic 8 points quantify in to him "doing a much better job" when Paul had 27?